When it comes to the quality of premium cabins, food, and service, U.S. airlines are often compared unfavorably with their overseas competitors. This is hardly fair. While none of the U.S. airlines offer the Emirates opulence, the Singapore service or the Turkish cuisine, it doesn’t mean that the core product of their premium-class cabins – the seat itself – is worse than the seats of their overseas competitors. Delta, for instance, has good-to-excellent long-haul business class seats that in most cases are not inferior to their rivals. Delta used to call their international long-haul business class product Business Elite, but it changed the name to Delta One (what is Delta One) to reflect the fact that its modern business class cabin is a two-in-one package that combines best typical first and business class features of its hard product and services. Having said that, their seats are a bit different depending on where you fly. Delta flies with true lie-flat seats on all their wide-body planes, and even some narrow-body planes too, like some 757s. 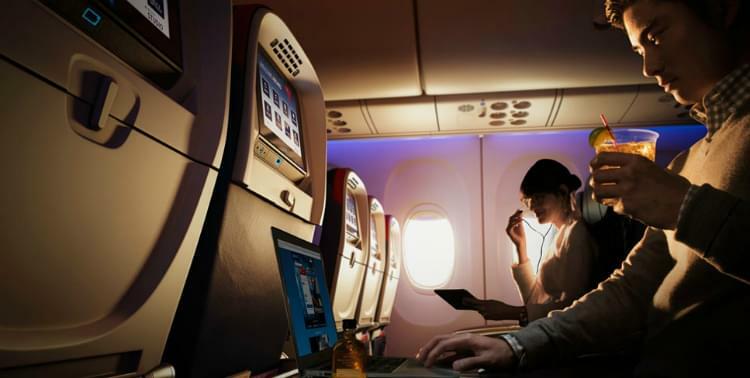 The type of lie-flat seat is really the only differentiator, because all Delta planes feature personal entertainment systems with a variety of movies and TV programs, and much improved catering. This is the most common airplane for Europe transpacific and transatlantic flights, with a staggered 1-2-1 direct aisle access configuration. The problem with this type of seat is that some of them have quite small foot cubbies, and others lack any sort of privacy. Choosing your seats boils down to what you prefer, especially if you travel solo. If you want the best shot at comfortable sleeping, grab an aisle seat as it has a larger area for your feet. If you don’t care about a smaller cubby, choose a window seat, as it affords a bit more privacy. And if you are traveling with a partner, it doesn’t really matter because the middle section is your only choice if you want to sit together. Delta uses 777s on longer routes to Japan, South Africa and Australia and others. 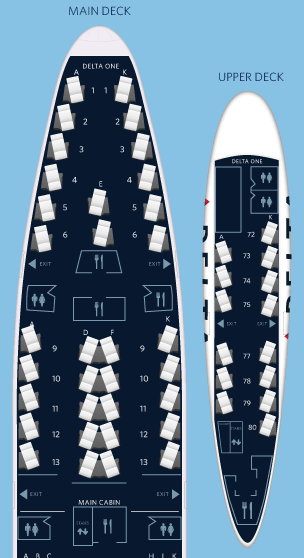 The 777 Delta One cabin features herringbone design with direct aisle access for every seat. These seats are angled toward the aisle and very similar to the ones installed on Virgin Atlantic. Delta catering and service in general in a 777 premium cabin consistently receive a lot of accolades from travelers. If you fly internationally from or via Detroit or Atlanta you may find yourself on another Delta wide-body aircraft, the 747. The Delta One cabin on this aircraft features reverse herringbone design, which most travelers consider the best premium class design in the world. Delta flies its 747 aircraft mostly to Asia, either directly or via Honolulu, but it’s also operated on some European destinations as well. Unlike herringbone, all reverse herringbone seats angle away from the aisle and offer a lot of privacy and personal space even in the middle section. And if you fly solo and like a window seat, you’ll actually get to look out the window. Aerobus 330 has the same reverse herringbone design as a 747. Delta flies them on select European and Latin America routes, as well as some transcontinental flights between New York and Los Angeles. However, Delta uses three planes to alternate their flights between JFK and LA: Boeing 767, Aerobus 330, and Boeing 757. Even though all of them feature fully lie-flat seats, A330 is preferable to others. Delta operates narrow-body 757s on many domestic routes, as well as short and medium-haul international routes. 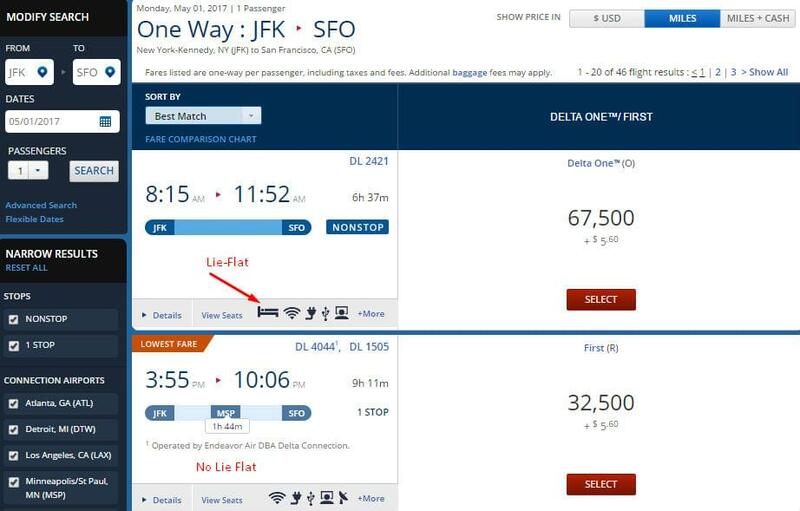 Delta also retrofitted some of them with new fully lie-flat seats to use on select routes, such as transcontinental flights between JFK and LA/SF. The seats come in a 2-2-2 configuration, which means that window seats on this plane don’t have direct aisle access. It may not be easy with some other airlines, but in case of Delta it’s easy as pie. Delta will tell you. If you see this icon when you are searching for you flight – you’re booking into a lie-flat seat. Note that all airlines reserve the right to change or substitute equipment without notice, but fortunately that doesn’t happen too often.